IP adresiniz: 3.80.128.196 · ABD · Şimdi TRUST.ZONE! Gerçek konumunuz gizli!Koruman zayıf! VPN encrypts and routes all of your traffic through the Trust.Zone VPN network. Your Internet Provider cannot see what you are downloading or browsing on the Internet. Anonymous VPN protects your privacy. 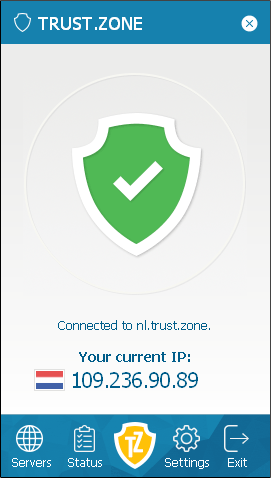 Trust.Zone VPN doesn't track customers. We don't store any logs. We don't ask for your name or personal details. Just email to sign up. Trust.Zone is located under Seychelles jurisdiction, outside 14 Eyes Countries, which is very friendly to Internet users. Trust.Zone hides your activity. Download any files and data privately, stream media with no risk!